Centurion University Entrance Exam (CUEE) is conducted by Centurion University, Odisha for admissions to B.Tech. (Engineering), BTech (Agriculture) and BSc Agriculture Courses offered at the University’s Bhubaneswar, Paralakhemundi, and Vijayanagarm/ Visakhapatnam Campuses. B. Tech Program at Paralakhemundi Campus: Electronics & Communication Engineering; Electrical Engineering; Electrical & Electronics Engineering; Computer Science & Engineering/IT; Mechanical Engineering; Civil Engineering; Chemical Engineering; Bio-Tech Engineering and Manning Engineering. B. Tech Program at Bhubaneswar Campus: Electronics & Communication Engineering; Electrical Engineering; Electrical & Electronics Engineering; Computer Science & Engineering; Mechanical Engineering; Civil Engineering. They must clear the qualifying examination with physics, Mathematics and Chemistry as main subjects or in Language, Physics, Chemistry, any one of the subjects (Biotechnology, Chemistry, Biology, Technical vocational subject) and other subject taken in qualifying examination. B.Tech (Agriculture): Should have done 10+2 science examination with at least 45% aggregate(40% marks for reserved category) in Physics, Chemistry and Mathematics. B.Sc (Agriculture Engineering): Must be passed in 10+2 examination with at least 50% aggregate(40% in case of candidates from reserved category) in PCB or PCM. For B.Sc. Ag, they should have scored a minimum of 50 marks in CUEE or 65 marks in JEE mains or 65 marks in EAMCET AND should have career 60 percent for all. For AP students, they should have career 80 percent. For Diploma Program: Candidates who have passed 10th examination or ITI Pass are eligible to apply for Diploma Course. Qualifying candidates will inform about the date, time and venue of Admission Procedure on the Admission Microsite. In certain cases, options of dates will be available giving greater flexibility to you. It is your responsibility to check the website. Eligible applicants will be able to download the admit card from university's official website at www.cutm.in. The admit card will be downloaded only after entering the candidate's registration number and submitting it. Candidates opting for online application are required to visit the CUEE 2019 Website www.cutm.ac.in and follow the instructions giving there to fill up the online application form. Step 1 - Fill up the application from and proceed to payment. Step 2 - Select the payment method - Demand Draft/Online payment (Debit/Credit Card of any bank is accepted). Step 3 - The Demand Draft payment method selection will complete the application process. If you select online payment it will redirect to the Merchant gateway. You need to fill up your card information and pay for the same and ensure the amount displayed is Rs.600/-. Step 4 - Download your Application Copy and take the print out of the application form. For other information, applicants may visit University website www.cutm.ac.in. 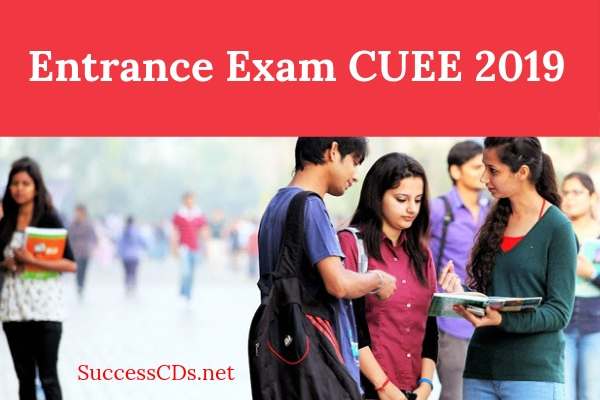 Registrations for Online CUEE Examination opens till 15th February 2019. Registrations for Offline CUEE Examination opens till 15th February 2019. Application Forms (Paralakhemundi and Jatni Campus): Application Form can also be downloaded from Centurion University Website www.cutm.ac.in. The application form and Information Brochure fee for all candidates is Rs.600/-. The candidate can also fill up application form, affix a recent color passport size photograph, along with a Demand Draft of Rs.600/- drawn in favor of CSREM TRUST, Payable at Bhubaneswar.